"The way Brockman interlaces essays about research on the frontiers of science with ones on artistic vision, education, psychology and economics is sure to buzz any brain." -Chicago Sun-Times, on This Will Change Everything Launching a hard-hitting new series from Edge.org and Harper Perennial, editor John Brockman delivers this cutting-edge master class covering everything you need to know about Culture. 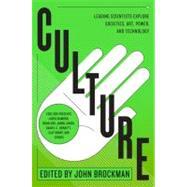 With original contributions by the world's leading thinkers and scientists, including Jared Diamond, Daniel C. Dennett, Brian Eno, Jaron Lanier, Nicholas Christakis, and others, Culture offers a mind-expanding primer on a fundamental topic. Unparalleled in scope, depth, insight and quality, Edge.org's Culture is not to be missed.